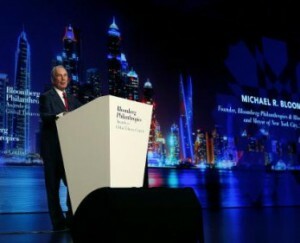 Billionaire philanthropists Michael Bloomberg and Bill Gates launched a joint fund in Abu Dhabi to help developing countries pass tobacco-control laws in their legal battle with industry giants. The Anti-Tobacco Trade Litigation Fund, backed by Bloomberg Philanthropies and the Bill & Melinda Gates Foundation, aims “to combat the tobacco industry’s use of international trade agreements to threaten and prevent countries from passing strong tobacco-control laws,” its creators say. “We are at a critical moment in the global effort to reduce tobacco use, because the significant gains we have seen are at risk of being undermined by the tobacco industry’s use of trade agreements and litigation,” said former New York mayor Bloomberg. The announcement was made on the second day of the 16th World Conference on Tobacco or Health. The World Health Organization has warned that although smoker numbers are declining in many parts of the world, upward trends in African and Mediterranean countries mean the global total will not change much during the next decade. About 80 percent of the world’s one billion smokers, it says, live in low- and middle-income countries. On Wednesday, Bloomberg granted governments and NGOs in Brazil, Nepal, Philippines, Russia, Ukraine and Uruguay his Philanthropies Awards for Global Tobacco Control for “significant strides” they have made in implementing tobacco control policies. Uruguay was the first country in Latin America to ban smoking in public spaces, a measure it enacted in 2006. Cigarette packs carry graphic pictures of cancer patients to warn smokers of the dangers, tobacco firms are forbidden from using marketing terms such as “light” or “mild,” and cigarette ads are banned from television, radio and newspapers. The crackdown has prompted industry giant Philip Morris to hit back by suing Uruguay for $25 million at the World Bank’s International Center for Settlement of Investment Disputes in 2010, alleging that the country had violated treaties by devaluing its trademarks and investments. Several other countries have been threatened by similar measures. “Country leaders who are trying to protect their citizens from the harms of tobacco should not be deterred by threats of costly legal challenges from huge tobacco companies,” said Microsoft co-founder Gates. “Australia won its first case, which sends a strong message. But smaller, developing countries don’t have the same resources. That’s why we are supporting the Anti-Tobacco Trade Litigation Fund with Bloomberg Philanthropies,” Gates said in a televised statement during the awards ceremony. Among its several means of support, the fund offers “technical assistance in legislative drafting and documentation to avoid legal challenges and potential trade disputes from the passage of tobacco-control laws,” its founders say. According to the WHO, one person dies every six seconds due to tobacco — nearly six million people each year. Smoking could kill one billion people this century, it says. Participants at the conference have warned that unless urgent action is taken, the annual death toll could rise to eight million by 2030.